As Ecuador’s largest city with almost 2.7 million people, Guayaquil is the commercial heart of Ecuador. 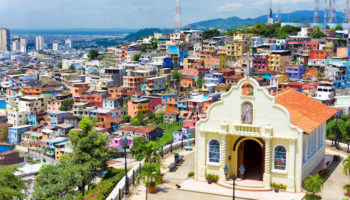 Located on the banks of the Guayas River that leads to the Pacific Ocean, the city was founded in 1538 by the Spanish conquistador Francisco de Orellana. The Parque Historico Guayaqui offers colonial buildings, lush gardens and animals native to the country; visitors especially like the free admission. 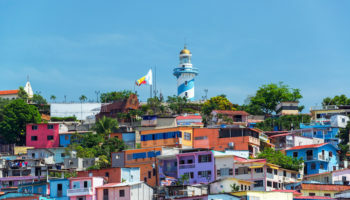 Las Peñas is a colorful, old neighborhood with a lighthouse and great views of the city below while Malecon 2000, a boardwalk along the river, is a great place to end the day. Mindo offers environmentally conscious travelers the best of two biodiversified ecosystems: the tropical Andes and the Chocoan lowlands. 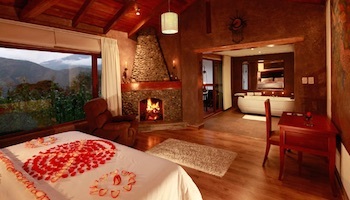 Here, visitors will see cloud forests, farmlands, three major rivers and hundreds of streams. One of Ecuador’s most popular tourist destinations, Mindo provides a wide variety of outdoor activities ranging from rafting and bird-watching to mountain biking, horseback riding and hiking. 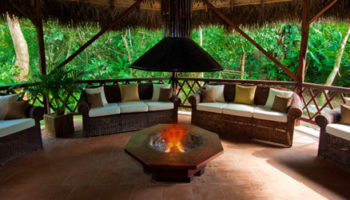 Travelers who prefer less strenuous activities may enjoy learning about chocolate from the cocoa bean to the finished product at El Quetzal del Mindo, a chocolatier. Salinas is the westernmost city in Ecuador, sitting on the Pacific Ocean, which makes it popular with surfers and yachters. Ecuador’s most popular beach resort city offers some great beaches. It is known as Little Miami Beach because of its high-rise condominiums dotting the shoreline. 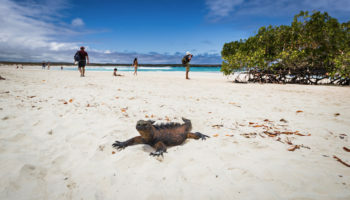 It also is home to La Chocolatera, which has nothing to do with chocolate, but is a beach where turtles lay their eggs, which means tourists need permission to enter. The best time to enjoy Salinas is December, early January. On summer weekends it gets unbearably packed, while from April to November it can be overcast and dreary. Hikers who enjoy trekking through the backcountry surely will enjoy the Quilotoa loop, a trail that takes visitors through several of Ecuador’s remote Andean villages. Hiking the loop can take up to four days, but can be done in less time if hikers take a bus between points, though they’d be missing out on some ancient trails if they did this. The views of a crater lake in Quilotoa are nothing short of spectacular. Villages host colorful markets throughout the week, with Sanquisili’s Thursday market considered one of the best. Riobamba, a city in the Andean highlands, is notable for a couple of reasons. One is its proximity to Chimaborazo, Ecuador’s highest mountain that stands 6,268 meters (20,564 feet) above sea level. It’s popular with hikers who often begin the trek at 1 a.m. in order to watch the sun rise. Secondly, it’s the starting point for the spectacular train ride to Nariz del Diablo (Devil’s Nose) that passes through both mountains and cloud forests. Riobamba hosts a market on Saturdays that is more authentic than other markets in Ecuador because it’s aimed at locals. The small city of Baños lies at the foot of the active volcano Tungurahua. Named after the hot springs fed by the thermal waters of the volcano, Baños is one of the most popular places to visit in Ecuador. Known as the “Gateway to the Amazon,” Baños is a favorite departure point for jungle tours. Waterfalls cascading thousands of feet down deep river gorges attract sightseers as well. The thunderous Pailon de Diablo waterfall, surging over a gorge where the Rio Verde and Rio Pastaza meet, is the most impressive. Cuenca, the capital of Azuay Province, is noted for its many old colonial buildings. A classic example of a planned Renaissance town in the Americas, Cuenca shares many architectural features with Old Quito. Its narrow, cobbled streets, balconied houses with interior courtyards and white churches however are all presented without the pollution, noise and crowds of the capital. 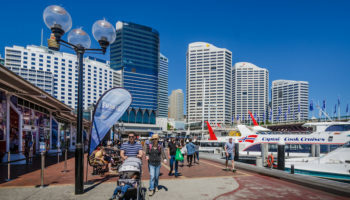 The city is popular with retired Americans and is known for its colorful festivals in January and November. The largest Inca ruins in Ecuador are nearby at the Canar plantation. Otavalo is home to one of the most colorful, important weekly markets in the Andes. It’s the place to go for traditional handmade craft items, including the exquisite textiles the city is famous for, leather goods and jewelry. The market has been going on for centuries, since even before the Incas. It’s a photographer’s paradise, with Ecuadorans wearing their traditional clothing and snow-covered mountains as a backdrop. The main market takes place on Saturdays, but travelers may be able to find handcrafts at other times in the Plaza de los Ponchos. 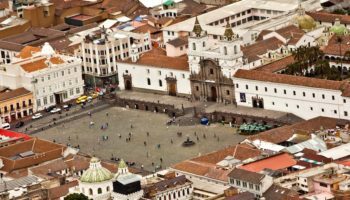 At 2,800 meters (9,350 feet) above sea level, the Ecuadoran capital of Quito is the highest capital city in the world. This cosmopolitan city of 2.2 million people is located in an active volcano section of the Andes. 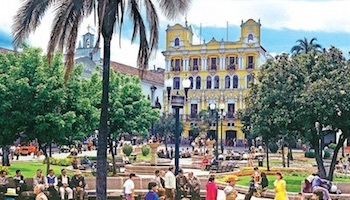 Quito has one of the largest and best preserved historic districts in South America. 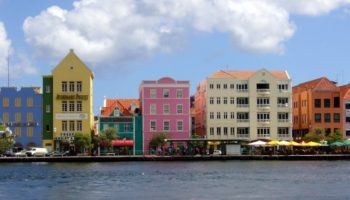 Founded in 1534, it contains no fewer than 20 Catholic churches from the colonial era and despite intensive restoration, the old town retains the vibrant working class and indigenous character that has always defined it. Carondolet Palace, the seat of Ecuador’s government, is located in the historic area. The 19 islands that make up the Galapagos Islands are home to unique wildlife not found anywhere else in the world. They’re best known as the site that inspired Charles Darwin to come up with his theory of evolution after visiting there in 1835. 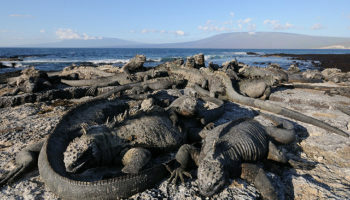 Located about 1,000 km (600 miles) offshore Ecuador, the Galapagos are home to such diverse species as giant tortoises, marine tortoises, flightless cormorants, and a variety of finches and mockingbirds. Cruises are the only way to explore the islands. 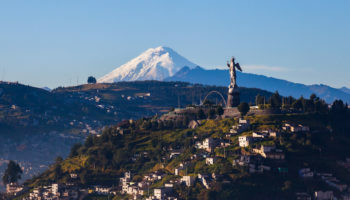 There are a great number of tour operations working out of Quito and Guayaquil with boat options ranging from small yachts to luxury cruise ships. 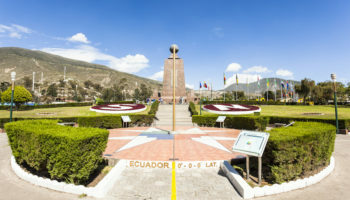 Which destination do you consider the best place to visit in Ecuador? These are all gorgeous places to visit on my trip to Ecuador next summer. I can not wait to hike the “Quilotoa Loop”. What are some of the most luxurious hotels to stay in? This is very helpful, but I just want to clarify that the highest capital city in the world is actually La Paz, Bolivia! Otherwise, great information! There is no way you can have a list of top things to do in Ecuador without including the Ecuadorian Amazon.